Trevor was born December 1, 1992. By all accounts he appeared to be just like any other baby. His big sister, Briana, is two and one-half years older than Trevor and set the standard for us as to what life with children would be like. At age two Briana was speaking in full sentences, while Trevor at age two was barely saying any words. Briana demanded almost constant attention from my wife, Patty and I, while Trevor preferred to play by himself. Trevor went to speech therapy and then to a special preschool for children with disabilities or behavioral issues. At age five we took him to the University of Washington Autism Center where they tested him and diagnosed him with Autism Spectrum Disorder (ASD) in the cate-gory of Pervasive Developmental Disorder – Not Otherwise Specified (PDD-NOS). There it was, we had an autistic child. As parents we were not at all prepared for life with an ASD child. Patty was a stay-at-home mom and became well versed in how to relate to Trevor; I, not nearly as much as Patty. While I did figure some things out, I made a lot of mistakes as a father that if I got a mulligan would never do again. That’s why I wrote Six-Word Lessons for Dads with Autistic Kids. 3. Will He Ever Amount to Anything? 5. Why Doesn't He Like Normal Things? 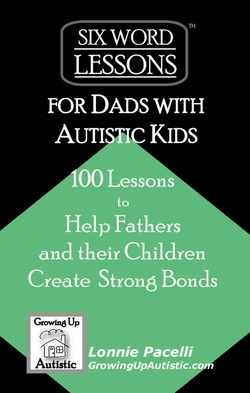 Each lesson is written in "man-speak" and gives you a concise explanation of what to do (and not do) to help fathers create a strong bond with both their autistic and non-autistic kids. Years of wisdom (and mistakes) in a book you can read in an hour! Bulk order? Contact Patty for special pricing!